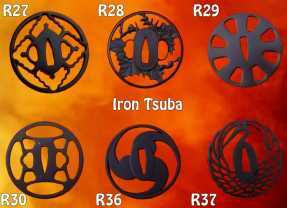 Batch 46 of the SBG Custom Katana is on hold until at least mid June 2019 while the forge works on making the previous batch. 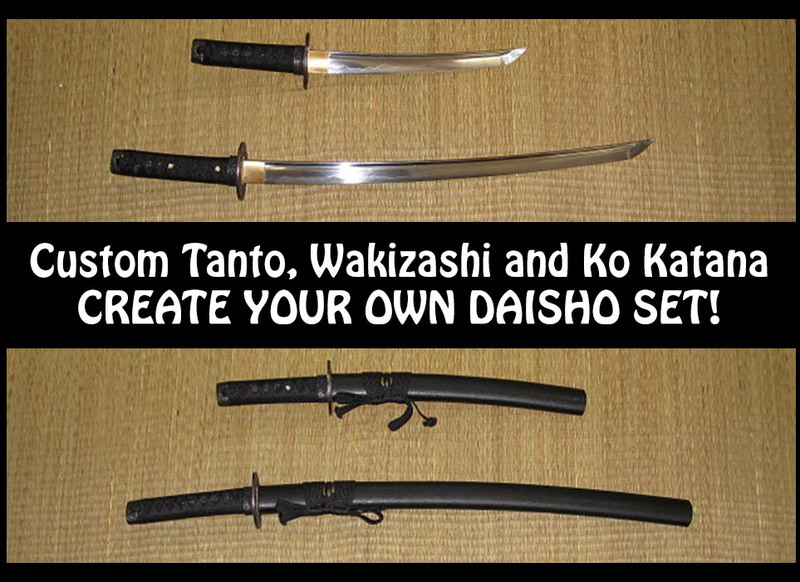 To create your Custom Wakizashi (one handed companion sword), Ko Katana (two handed, short blade Katana) or Tanto ($299) simply decide what design combination you'd like us to make and then use the drop down menu below to make your selections in exactly the same way that you make a custom Katana. 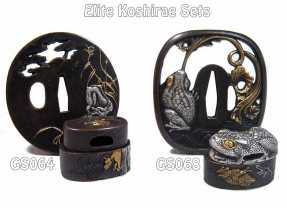 For Tanto designs that select the premium fittings sets, they will be designed in the 'Aikuchi' style, i.e. 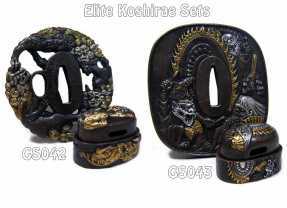 no tsuba - but with the Fuchi and Kashira only as the tsuba are not resized and look too big. We will confirm with you by email once we receive your design and pre-payment, sending you a mock up of what it will likely look like. We have deliberately kept the number of options streamlined to only the best and most popular options. So for people want something just a little bit more special – so we have narrowed it down to 3 optional upgrades that can be purchased at the same time along with your sword – A Folded Blade Option, Rayskin Wrapped Saya and/or premium leather ito wrap. 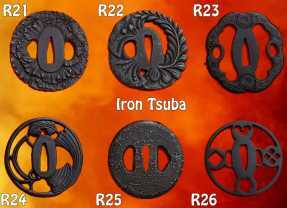 To add these to your design, add each one as a ‘separate’ product to the cart and it will be applied to your base sword design accordingly. 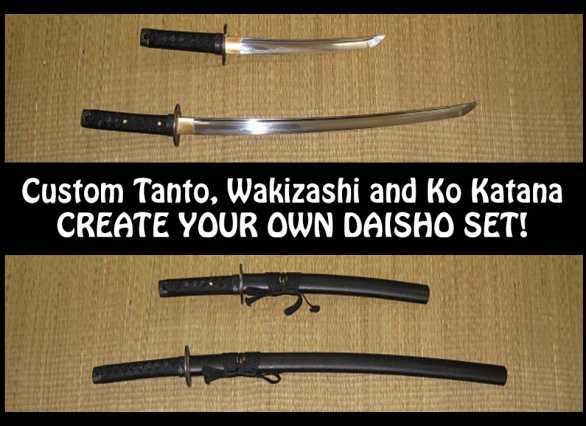 Please note that as the actual processes and materials are almost identical to those on a full length Katana and the fact that the prices are heavily discounted already and I am afraid to advise that there is no price break for the components for the Wak, Ko and Tanto - these options cost the same across the board. 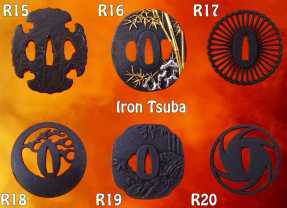 Naturally none of these options are necessary to create a fantastic personalized design, but after so many requests for them they are worth adding just in case one of these elements is the missing touch your personalized sword requires. 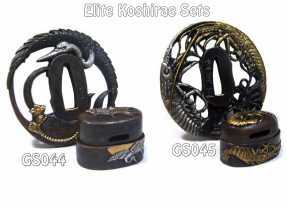 Simply make your selection at the top of the page as normal, order the basic sword, and then pick and choose any extras like a smorgasbord before submitting your final order. 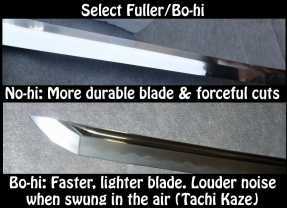 Blade: Sharpened Differentially Hardened T-10 High Speed Tool Steel with natural hamon. 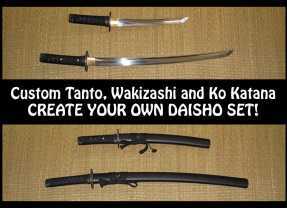 Blade Length: Both Ko Katana and Wakizashi have a shorter 22" blade (but the Ko-Katana has a standard two handed grip, making it very zippy and versatile, while the wakizashi is usually only used with one hand. 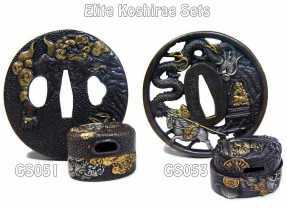 Fittings: Select either solid iron or work hardened copper with real gold and silver plating. 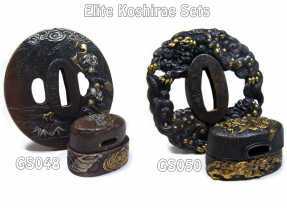 Strongest fittings available on the market. 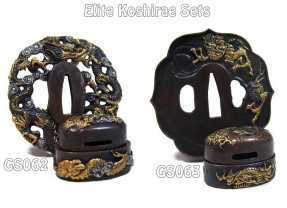 Designed for traditional cutting practice. 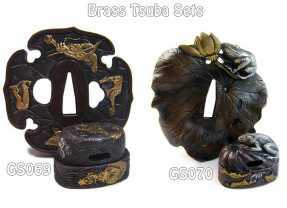 Also suitable as a high quality display sword or family heirloom. 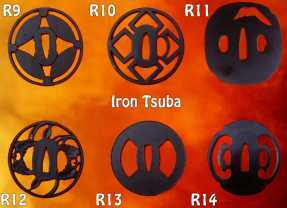 Companion blades added to a Custom Katana 3.0 order or as a standalone. Sharpened Differentially Hardened T-10 High Speed Tool Steel with natural hamon. 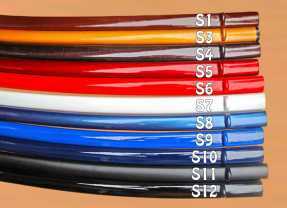 High quality iron or work hardened copper fittings. Authentic rayskin panels. 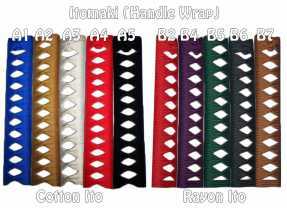 Tightly wrapped cotton or synthetic silk ito in 11 colors (optional upgrade to leather with hisigami also available). 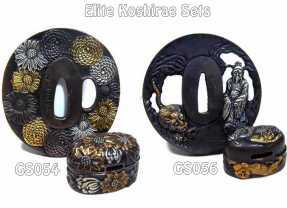 Premium polished kissaki with real geometric yokote (rare). The service was not so excellent- Questionable wait and responses to inquiries. I will give it to them this time with their main guy down for several weeks. I may try giving them another chance later.